Whether you’re looking for a traditional keyboard, a wireless version, or keyboard that will interact with your home technology, Logitech offers a wide range of products to meet your needs. 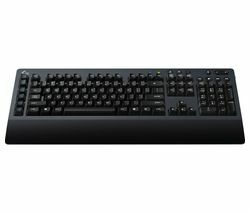 Our range of Logitech keyboards includes the Logitech K400 Plus Wireless Keyboard Dark Grey with an in-built touchpad, the Logitech K120 Keyboard for quick and quiet typing, the Logitech K780 Multi-Device Wireless Keyboard that allows you to switch between devices at the touch of a button; and the Logitech K750 Solar Wireless Keyboard, which runs off solar power. Regardless of your requirements, there’s sure to be a Logitech keyboard to suit them! 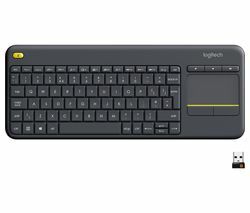 The Logitech Illuminated Living-Room K830 Wireless Keyboard, for example, connects with your Smart TV and allows you browse the web, navigate on-demand menus, or update your social media status from the comfort of your sofa. If you’re a keen gamer, you’ll love our range of Logitech gaming keyboards, such as the Logitech G13 Advanced Gameboard and the Logitech G610 Orion Brown Mechanical Gaming Keyboard. Designed to meet the needs of gamers, these specialist keyboards will revolutionise the way you play with features such as easy access media controls, customisable key lighting and button pre-sets, customisable joysticks, LCD screen with real-time stats and data, and anti-ghosting functionality. If you want to take your work, gaming, or home to the next level, take a look at our full range of keyboards.